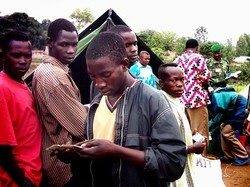 BUNIA, 6 Jul 2006 (IRIN) - The deadline for militias in the Democratic Republic of Congo's northeastern district of Ituri to voluntarily surrender and join a disarmament and demobilisation programme has been extended to 15 July. "The deadline has been extended because we are seeing up to 250 combatants coming to disarm every day. These figures pushed us to get an extension," said Carmine Camerini, a public information officer with MONUC, the United Nations mission in the DRC. The government, MONUC and the National Commission for Disarmament, Demobilisation and Reintegration, known as CONADER, had set 30 June as the deadline. At least 2,500 militiamen and women surrendered within a few days before the deadline expired, taking advantage of the initiative in which they were offered cash in exchange for their guns. CONADER is overseeing the disarmament, demobilisation and reintegration (DDR) programme in conjunction with the Congolese army, MONUC and the UN children's fund (Unicef). Col Francois Xavier Duku, CONADER's community head of office in Bunia - the main town in Ituri - said the DDR programme was expected to continue until 2007. "When we ended the initial phase in mid-2005, we realised that not everyone had been disarmed and there were some who kept their weapons," Duku said. "It was good to give them a chance to come out of the bush and disarm." The remaining militias are informed about the DDR programme via broadcasts on the MONUC-supported Radio Okapi as well as by the distribution of leaflets in Swahili, French and the local Lendu language, airdropped using MONUC helicopters. Those wishing to surrender then make their way to one of 15 disarmament points across Ituri where they are disarmed, registered and taken to a demobilisation transit camp in Bunia. Once at the transit site, they choose whether to begin a process of reintegration into civilian society or to join the national army. A bloody ethnic conflict in Ituri between the Hema and Lendu communities in the aftermath of Congo's two wars, which formally ended in 2003, saw the two sides heavily tooled up with small arms and light weapons, resulting in at least 50,000 deaths. Remnants of that conflict still pose a serious security threat in Ituri, where militias regularly clash with the army and MONUC, which are trying to pacify the area in preparation for the country's first democratic elections, scheduled to be held on 30 July. "At the moment it is not foreseen that the deadline will be extended again," Camerini said. "After 15 July the plan is to begin with military operations. Whoever is found in possession of arms will be considered outside the law." Weapons collected, including automatic rifles, ammunition, landmines and rocket-propelled grenades, are either destroyed or recycled and used by the army. Estimates suggest there could be at least 5,000 armed fighters still active in Ituri. However, this number could be higher as an exact figure cannot be ascertained due to the common use by the various armed groups of women and children in military activities. Camerini said that with the forthcoming elections, the extension of the deadline was the last chance for militias to take advantage of the DDR programme and lay down their arms to reintegrate back into society. "After the deadline, there will be forced disarmament operations in order to guarantee security for the approaching elections," he said.